stomach acid can adversely affect the vocal cords causing hoarseness or even be inhaled into the lungs (called aspiration). When we eat, food is carried from the mouth to the stomach through the esophagus, a tube-like structure that is approximately 10 inches long and 1 inch wide in adults.The esophagus is made of tissue and muscle layers that expand and contract to propel food to the stomach through a series of wave-like movements called peristalsis. At the lower end of the esophagus, where it joins the stomach, there is a circular ring of muscle called the lower esophageal sphincter (LES). After swallowing, the LES relaxes to allow food to enter the stomach and then contracts to prevent the back-up of food and acid into the esophagus. However, sometimes the LES is weak or becomes relaxed because the stomach is distended, allowing liquids in the stomach to wash back into the esophagus. This happens occasionally in all individuals. Most of these episodes occur shortly after meals, are brief, and do not cause symptoms. Normally, acid reflux should occur only rarely during sleep. Acid reflux - Acid reflux becomes gastroesophageal reflux disease (GERD) when it causes bothersome symptoms or injury to the esophagus. The amount of acid reflux required to cause GERD varies. In general, damage to the esophagus is more likely to occur when acid refluxes frequently, the reflux is very acidic, or the esophagus is unable to clear away the acid quickly. The most common symptoms associated with acid reflux are heartburn, regurgitation, chest pain, and trouble swallowing. The treatments of GERD are designed to prevent one or all of these symptoms from occurring. Hiatus hernia - The diaphragm is a large flat muscle at the base of the lungs that contracts and relaxes as a person breathes in and out. The esophagus passes through an opening in the diaphragm called the diaphragmatic hiatus before it joins with the stomach. Normally, the diaphragm contracts, which improves the strength of the LES, especially during bending, coughing, or straining. If there is a weakening in the diaphragm muscle at the hiatus, the stomach may be able to partially slip through the diaphragm into the chest, forming a sliding hiatus hernia. The presence of a hiatus hernia makes acid reflux more likely. A hiatus hernia is more common in people over age 50. Obesity and pregnancy are also contributing factors. The exact cause is unknown but may be related to the loosening of the tissues around the diaphragm that occurs with advancing age. There is no way to prevent a hiatus hernia. = Bleeding (vomiting blood or dark-colored stools). 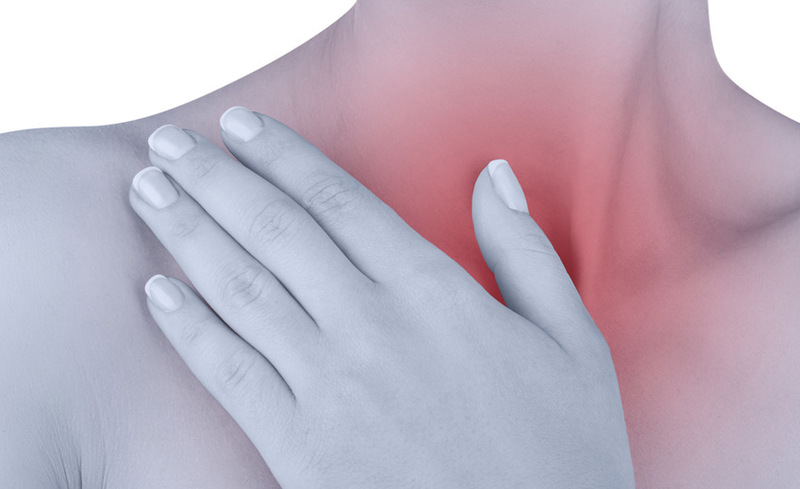 Acid reflux is usually diagnosed based upon symptoms and the response to treatment. In people who have symptoms of acid reflux but no evidence of complications, a trial of treatment with lifestyle changes and in some cases, a medication, are often recommended, without testing. Specific testing is required when the diagnosis is unclear or if there are more serious signs or symptoms as described above. It is important to rule out potentially life threatening problems that can cause symptoms similar to those of gastroesophageal reflux disease. This is particularly true with chest pain, since chest pain can also be a symptom of heart disease. When the symptoms are not life threatening and the diagnosis of gastroesophageal reflux disease is not clear, one or more of the following tests may be recommended. Endoscopy - An upper endoscopy is commonly used to evaluate the esophagus. A small, flexible tube is passed into the esophagus, stomach, and small intestine. The tube has a light source and a camera that displays magnified images. Damage to the lining of these structures can be evaluated and a small sample of tissue (biopsy) can be taken to determine the extent of tissue damage. 24-hour esophageal pH study - A 24-hour esophageal pH study is the most direct way to measure the frequency of acid reflux, although the study is not always helpful in diagnosing gastroesophageal reflux disease or refluxassociated problems. It is usually reserved for people whose diagnosis is unclear after endoscopy or a trial of treatment. It is also useful for people who continue to have symptoms despite treatment. The test involves inserting a thin tube through the nose and into the esophagus. The tube is left in the esophagus for 24 hours. During this time the patient keeps a diary of symptoms. The tube is attached to a small device that measures how often stomach acid is reaching the esophagus. The data are then analyzed to determine the frequency of reflux and the relationship of reflux to symptoms. An alternate method for measuring pH uses a device that is attached to the esophagus and broadcasts pH information to a monitor worn outside of the body. This avoids the need for a tube in the esophagus and nose. The main disadvantage is that an endoscopy procedure is required to place the device (it does not require removal, but simply passes on its own in the stool). Esophageal manometry - Esophageal manometry involves swallowing a tube that measures the muscle contractions of the esophagus. This can help to determine if the lower esophageal sphincter is functioning properly. This test is usually reserved for people in whom the diagnosis is unclear after other testing or in whom surgery for reflux disease is being considered. Ulcers - Ulcers can form in the esophagus as a result of burning from stomach acid. In some cases, bleeding occurs. You may not be aware of bleeding, but it may be detected in a stool sample to test for traces of blood that may not be visible. This test is performed by putting a small amount of stool on a chemically coated card. Stricture - Damage from acid can cause the esophagus to scar and narrow, causing a blockage (stricture) that can cause food or pills to get stuck in the esophagus. The narrowing is caused by scar tissue that develops as a result of ulcers that repeatedly damage and then heal in the esophagus. Lung and throat problems - Some people reflux acid into the throat, causing inflammation of the vocal cords, a sore throat, or a hoarse voice. The acid can be inhaled into the lungs and cause a type of pneumonia (aspiration pneumonia) or asthma symptoms. Chronic acid reflux into the lungs may eventually cause permanent lung damage, called pulmonary fibrosis or bronchiectasis. Barrett's esophagus - Barrett's esophagus occurs when the normal cells that line the lower esophagus (squamous cells) are replaced by a different cell type (intestinal cells). This process usually results from repeated damage to the esophageal lining, and the most common cause is longstanding gastroesophageal reflux disease. The intestinal cells have a small risk of transforming into cancer cells. As a result, people with Barrett's esophagus are advised to have a periodic endoscopy to monitor for early warning signs of cancer. Esophageal cancer - There are two main types of esophageal cancer: adenocarcinoma and squamous cell carcinoma. A major risk factor for adenocarcinoma is Barrett's esophagus, discussed above. Squamous cell carcinoma does not appear to be related to GERD. Unfortunately, adenocarcinoma of the esophagus is on the rise in the United States and in many other countries. However, only a small percentage of people with GERD will develop Barrett's esophagus and an even smaller percentage will develop adenocarcinoma. Gastroesophageal reflux disease is treated according to its severity. Mild symptoms - Initial treatments for mild acid reflux include dietary and using non-prescription medications, including antacids or histamine antagonists. Lifestyle changes - Changes to the diet or lifestyle have been recommended for many years, although their effectiveness has not been extensively evaluated in well-designed clinical trials. A review of the literature concluded that weight loss and elevating the head of your bed may be helpful, but other dietary changes were not found helpful in all patients. Thus, these recommendations may be helpful in some, but not all people with mild symptoms of acid reflux. For people with mild acid reflux, these treatments can be tried before seeking medical attention. However, anyone with more serious symptoms should speak to their healthcare provider before using any treatment. Weight loss – Losing weight may help people who are overweight to reduce acid reflux. In addition, weight loss has a number of other health benefits, including a decreased risk of type 2 diabetes and heart disease. Raise the head of the bed six to eight inches – Although most people only have heartburn for the two- to three-hour period after meals, some wake up at night with heartburn. People with nighttime heartburn can elevate the head of their bed, which raises the head and shoulders higher than the stomach, allowing gravity to prevent acid from refluxing. Raising the head of the bed can be done with blocks of wood under the legs of the bed or a foam wedge under the mattress. Several manufacturers have developed commercial products for this purpose. However, it is not helpful to use additional pillows; this can cause an unnatural bend in the body that increases pressure on the stomach, worsening acid reflux. Quit smoking – Saliva helps to neutralize refluxed acid, and smoking reduces the amount of saliva in the mouth and throat. Smoking also lowers the pressure in the lower esophageal sphincter and provokes coughing, causing frequent episodes of acid reflux in the esophagus. Quitting smoking can reduce or eliminate symptoms of mild reflux. Avoid large and late meals – Lying down with a full stomach may increase the risk of acid reflux. By eating three or more hours before bedtime, reflux may be reduced. In addition, eating smaller meals may prevent the stomach from becoming overdistended, which can cause acid reflux. Avoid tight fitting clothing – At minimum, tight-fitting clothing can increase discomfort, but it may also increase pressure in the abdomen, forcing stomach contents into the esophagus. Chew gum or use oral lozenges – Chewing gum or using lozenges can increase saliva production, which may help to clear stomach acid that has entered the esophagus. Antacids - Antacids are commonly used for short-term relief of acid reflux. However, the stomach acid is only neutralized very briefly after each dose, so they are not very effective. Examples of antacids include Tums, Maalox, and Mylanta. Histamine antagonists - The histamine antagonists reduce production of acid in the stomach. However, they are somewhat less effective than proton pump inhibitors (PPIs). Examples of histamine antagonists available in the United States include ranitidine (Zantac), famotidine (Pepcid), cimetidine (Tagamet), and nizatidine (Axid). These medications are usually taken by mouth once or twice per day. Cimetidine, ranitidine, and famotidine are available in prescription and nonprescription strengths. Moderate to severe symptoms - Patients with moderate to severe symptoms of acid reflux, complications of gastroesophageal reflux disease, or mild acid reflux symptoms that have not responded to the lifestyle modifications and the medications described above usually require treatment with prescription medications. Most patients are treated with a proton pump inhibitor. Proton pump inhibitors - PPIs include omeprazole (Prilosec), esomeprazole (Nexium), lansoprazole (Prevacid), dexlansoprazole (Kapidex), pantoprazole (Protonix), and rabeprazole (AcipHex), which are stronger and more effective than the H2 antagonists. Once the optimal dose and type of PPI is found, you will probably be kept on the PPI for approximately eight weeks. Depending upon your symptoms after eight weeks, the medication dose may be decreased or discontinued. If symptoms return within three months, long-term treatment is usually recommended. If symptoms do not return within three months, treatment may be needed only intermittently. The goal of treatment for GERD is to take the lowest possible dose of medication that controls symptoms and prevents complications. Proton pump inhibitors are safe, although they may be expensive, especially if taken for a long period of time. Long-term risks of PPIs may include an increased risk of gut infections, such as Clostridium difficile (C. diff), or reduced absorption of minerals and nutrients. In general, these risks are small. However, even a small risk emphasizes the need to take the lowest possible dose for the shortest possible time. Surgical treatment - Prior to the development of the potent acid-reducing medications described above, surgery was used for severe cases of GERD that did not resolve with medical treatment. Because of the effectiveness of medical therapy, the role of surgery has become more complex. In general, anti-reflux surgery involves repairing the hiatus hernia and strengthening the lower esophageal sphincter. The most common surgical treatment is the laparoscopic Nissen fundoplication. This procedure involves wrapping the upper part of the stomach around the lower end of the esophagus. Although the outcome of surgery is usually good, complications can occur. Examples include persistent difficulty swallowing (occurring in about 5 percent of patients), a sense of bloating and gas (known as "gas-bloat syndrome"), breakdown of the repair (1 to 2 percent of patients per year), or diarrhea due to inadvertent injury to the nerves leading to the stomach and intestines..